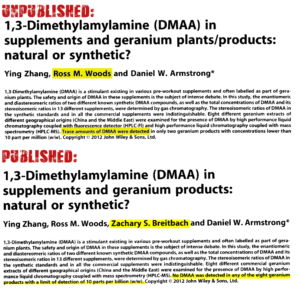 The Daniel Armstrong / Ying Zhang DMAA Study Scandal: "1,3-Dimethylamylamine (DMAA) in supplements and geranium products: natural or synthetic?" This is part three of a six page series researching whether DMAA (1,3 dimethylamylamine) is a natural constituent of geranium flowers. All six parts are linked from our main DMAA in Nature / Geranium page. No, your honor, nothing suspicious going on here! Prepare to go down the rabbit hole, because this one gets nasty. In our previous article, we showed how paid researchers found DMAA but claimed that there was an “absense” of DMAA in the study’s very title, while privately emailing plans to downplay their true findings. While that was unethical, it comes nowhere close to the absurd situation that unfolded with the study analyzed below. So many “abnormalities” occurred throughout the course of this research, we actually had to produce a timeline to keep it all straight, and even then we’re left with a massive number of questions. Brace yourself, this is a long article, and it may forever change the way you look at published research. Bummer, they didn’t find DMAA in geranium, right? What is this?! So they did find DMAA? [21,22] What happened to the data?! See what they did there??? After finding DMAA in natural products, “something happened”, and the paper was modified to claim that it no longer existed at those levels! That’s just the tip of the iceberg, though. Below is our most detailed investigation of what transpired when “something happened” as stated above. Why were entire charts and measurement techniques removed between versions? There were additional changes between this unpublished study and the final one published. As Hi-Tech Pharma’s evidence points out, entire HPLC charts were removed from the final publication. They also removed any mention of the measurement method that detected DMAA (HPLC-Fl). What happened to these charts in red between the two versions? Why was HPLC-Fluorescence data removed? Why did the researchers state that there was a “typo” when delaying publication? Why was Zachary S. Breitbach added so abruptly? Also note how a new researcher, Zachary S. Breitbach, was added to the final paper. Is it normal practice to add a new researcher so late in the game when a paper is near completion? Where’d he come from and why? Why is the revision date clearly wrong? …when there is strong evidence shown below that the paper was edited at some point between May 22, 2012 and July 12, 2012? Is it reasonable to have revisions after the final revision and acceptance dates? All in all, in a total of about 984 words were removed and roughly 943 words were added between these two revisions — keep those numbers in mind. But it gets even crazier. We are literally only scratching the surface. In the first release, published on May 30, 2012, the release states that “The two geranium oils contained a very small amount of DMAA, with 7 mg/kg in one and 3 mg/kg in the other.” — which is exactly what correlates to the original findings in the now-uncovered unpublished research! 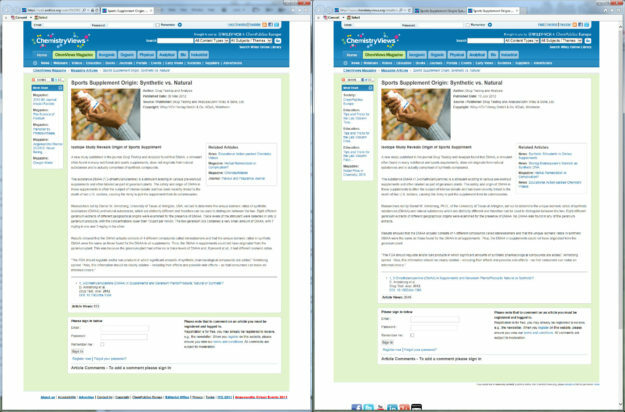 To see for yourself, archives of the original press release and the updated press release are right there on the web. And note, if there’s any funny business and those archives get conveniently removed from the web, we have archives of the archive preserved online elsewhere. The published version of Daniel Armstrong’s Geranium study reeks of so much foul play that it warrants a true hand-on-the-Bible investigation under oath. Wiley, the online research library, published the original study on June 12, 2017 in their Early View section of their journal (Drug Analysis and Testing), ahead of print. 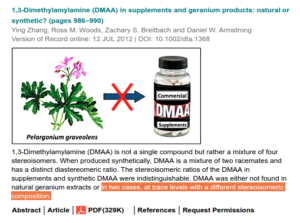 To this day, they still have not removed their summary release stating that “DMAA was either not found in natural geranium extracts or in two cases, at trace levels with a different stereoisomeric composition.” (archive) Right there, the research publication itself is stating that DMAA was found and published as such — and what was found in the oil was different than the synthetic standards! Repeat that — what was found in the oil was different than the synthetic standards. This means that the DMAA found in the oil could NOT have been an impurity from the synthetic DMAA testing standards getting into the equipment – it was legitimate, all-natural geranium-oil-based DMAA! So where would Wiley get and publish such information?? We reached out to Daniel W. Armstrong (LinkedIn) to find out what happened here. 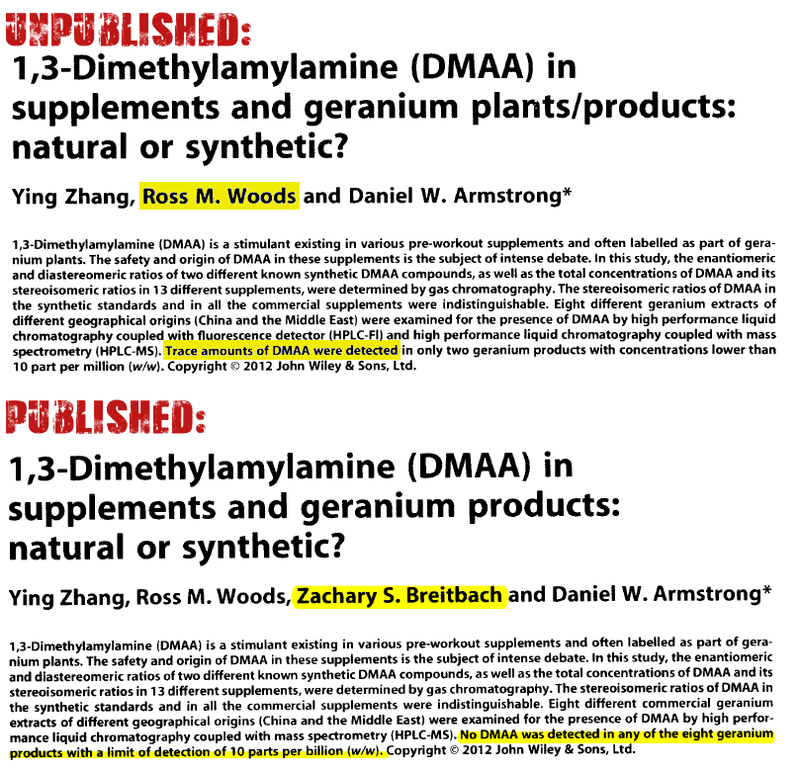 I’m investigating all of the times DMAA has been found in geranium plant and oil material, and your paper, “1,3-Dimethylamylamine (DMAA) in Supplements and Geranium Products: Natural or Synthetic?” came up. Can you please tell me how this is possible? What exactly happened there? There was never a press release where we said that there were small amounts of DMAA in geranium. When we originally sent to paper for review we thought we had detected small amounts. However, during review, we then found the isomeric ratio was the same as a synthetic standard that we were using. So we rechecked everything and found that one of our pieces of equipment had been contaminated with the standard and that was what we were detecting. We caught this and corrected it before publication. We were then shocked when we saw that the journal mistakenly put up the earlier, incorrect version on the web (it had no page numbers yet) that we never okayed. They immediately corrected the mistake when we contacted them. Unfortunately, in the day or two that it was on the web, a few people downloaded what never should have appeared. Note that this was actually only a small part of the paper. All of the rest of the results indicated that the DMAA in commercial products was of synthetic origin. There was never a press release stating it was found? Then what is this? The isomeric ratio was the same as the synthetic standard? That’s not what Wiley’s website says here (archive) — “DMAA was either not found in natural geranium extracts or in two cases, at trace levels with a different stereoisomeric composition. Thanks for the quick response Dr. Armstrong. Where would they get such information from? Maybe you know someone who I can contact over there to get it cleared up? I think you may have misunderstood something. Wiley did not write anything. Their only fault was to mistakenly and briefly put on-line an earlier uncorrected, withdrawn manuscript that never should have seen the light of day. How this happened, I have no idea. When we wrote an initial draft of this paper, my graduate student thought there was a small peak in 2 geranium samples that could be DMAA. In natural sample extracts there can be many small overlapping peaks. However, this result wasn’t validated by mass spectrometry and we had to make some other small changes in the paper, so it was withdrawn. While making the other small corrections, we triple checked the results including doing MS analysis. Using an independent MS analysis, we found no DMAA in any geranium samples. It was when we used this method with the previous sample work-up that we found the contamination. It was at this point that we also found that the diastereomeric ratio was the same as the standards. We were happy that we caught the mistake and corrected it before publication. Hence our shock when Wiley briefly put on-line the earlier incorrect, withdrawn manuscript. “Some other small changes in the paper”, as in… nearly 2000 words worth? As in, the complete removal of measurement methods that found DMAA? “we also found that the diastereomeric ratio was the same as the standards” — again, that’s not what the publisher’s website says to this day here (archive), and there’s further data to back this up. With so much focus on contamination and “the diastereomeric ratio was the same as the standards“, but where is that backed up by actual data? Where is contamination discussed in the paper? Where are the cleaning and preparation procedures? Before we go forward, we need to give a bit of background. Chemical compounds have “configurations” or “orientations” that are in a different presentation even though they’re of the same molecular formula — let’s call them “right-handed” and “left-handed”. Synthetically manufactured DMAA has a certain amount of left vs. right-handedness. This amount is presumed to be different than organic DMAA. Mind you, the researchers continually publish that organic DMAA doesn’t exist. Armstrong is claiming that there was contamination — ie, some of that synthetic DMAA got into the measurement equipment and created a false positive for the Geranium Oil tested. The ORIGINAL Supplementary Materials Show they detected a DIFFERENT DMAA than the Synthetic DMAA’s configuration! Continuing to dig, we got our hands on what may be the original supplementary data that was released in the supporting information section of the paper originally published on July 12, 2012. You can download the original supplementary data here. Note that this document is not 100% validated, and we have contacted several employees at Wiley, both past and present, in an attempt to confirm it. However, the story here corroborates with what’s still published at Wiley — the NOW Foods Geranium Oil has a different diastereomeric ratio than the synthetic stuff! If the alleged supplementary data is correct, it contradicts the emails Dr. Armstrong sent us. However, the HPLC-Fluorescence data was completely discarded. We will forever wonder the true reason why. 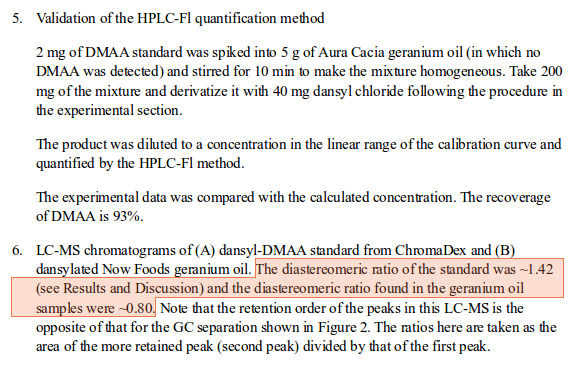 This alleged originally-published supplementary material states that LC-MS chromatograms of (A) dansyl-DMAA standard from ChromaDex and (B) dansylated Now Foods geranium oil. The diastereomeric ratio of the standard was ~1.42 (see Results and Discussion) and the diastereomeric ratio found in the geranium oil samples were ~0.80. Do these look the same to you? (A) is from the ChromaDex standard, while (B) was measured from NOW Foods Geranium Oil. If this alleged supplementary data is valid, then it looks like we have something different than the synthetic standard… and that means it couldn’t have been contamination! Assuming the data is valid, then we would love to know how in the world they ever measured chart (B) above at all if the machinery was determined to be “contaminated with (A)”??? The story as provided just doesn’t add up. And it looks even crazier when you learn that the entire HPLC-Fluorescence data — from which these charts and measurements came from — was completely discarded! Further, this data is exactly what is confirmed by the original (“unpublished”) version of the article unearthed in the court documents linked above, along with the same early release information that lies on Wiley.com to this day and archived on other science news outlets! Did Armstrong tip his hand in this interview? How on earth would he even know that? Unless, perhaps… he had indeed found DMAA in nature?! Once again, they originally claimed they found different DMAA from the synthetic stuff used in supplements! Why was that data trashed? So long story short, they found DMAA once again. And never reported their full HPLC-Fluorescence findings. 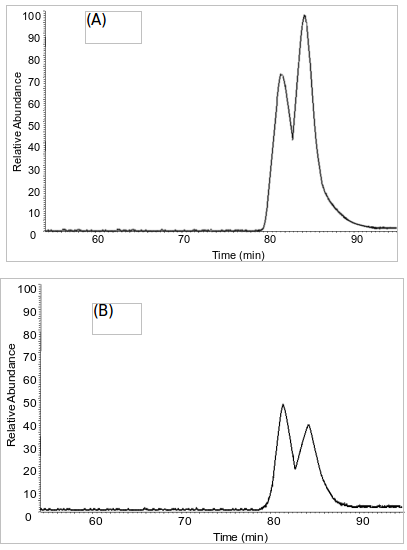 Interestingly, that original supplementary material posted above provides a calibration curve and validation procedure for a detection method (HPLC-Fluorescence) that’s not at all used in the published paper. We have to wonder if some positive results from that methodology discarded in favor of negative results from another method? So please tell us, Dr. Armstrong, Ying Zhang, Ross M. Woods, and Zachary S. Breitbach, what is the definition of “contamination”? How on earth do you un-find a chemical?! How do you chalk a change of nearly 2000 words to a “typo” or “small changes”?! The published paper has another problem: Other researchers have been unable to replicate the processes that the Armstrong team claims to have used to separate the stereoisomers! FDA Lawyer: It says there in paragraph 67 that: “The FDA falsely states that detection of 1,3-DMAA requires derivatization for analysis at the low concentrations reported.” And then it goes on to say: “The FDA clearly does not understand the purpose of derivatization in analysis.” Did in fact you conduct a derivatization analysis as part of your study of the samples provided to you by USP Labs? Dr. Simone: I did both. I did both with and without derivatization. In the first study in the published geranium paper in the 2012 Analytical Chemistry Insights paper, we did direct detection of 1,3- and 1,4-DMAA. In the second set of analyses that we did for the chiral analysis of the 1,3-DMAA, we used derivatization to convert the two pairs of enantiomers to four diastereomers to more effectively separate our stereoisomers. And so in terms of detection of the 1,3-DMAA at the parts per billion level, you don’t have to derivatize it. In terms of separating the stereoisomers, you have to do it one of two ways. You have to have either a chiral column, which we tried, and that chiral column was actually developed by Armstrong’s group, Daniel Armstrong, who published with Zhang. It turns out it didn’t work. I don’t really know why it didn’t work. The chiral column separation didn’t work. And so then we turned to the chiral derivatizing agents of Fleck and Mosher’s acid chloride. This raises alarming new questions. In Armstrong’s alleged unpublished supplementary material discussed above, there are valid stereoisomer readings that are different than the synthetic ones, which again, are still on Wiley’s website to this day. But those methods were then removed from the paper prior to publishing, and apparently replaced with a methodology that another expert researcher could never get to work! Why would any credible researcher do such a thing?? There’s so much stench to this paper that it’s difficult to know where to even begin when questioning it. At what point in the peer review process were these changes made? What really happened to those larger DMAA numbers that were originally published? Shouldn’t you publish that you did find it at levels lower than your level of detection, or at least show it in your supplementary information? What happened to all of that HPLC-Fluorescence data, and why was it not published or reported at all? 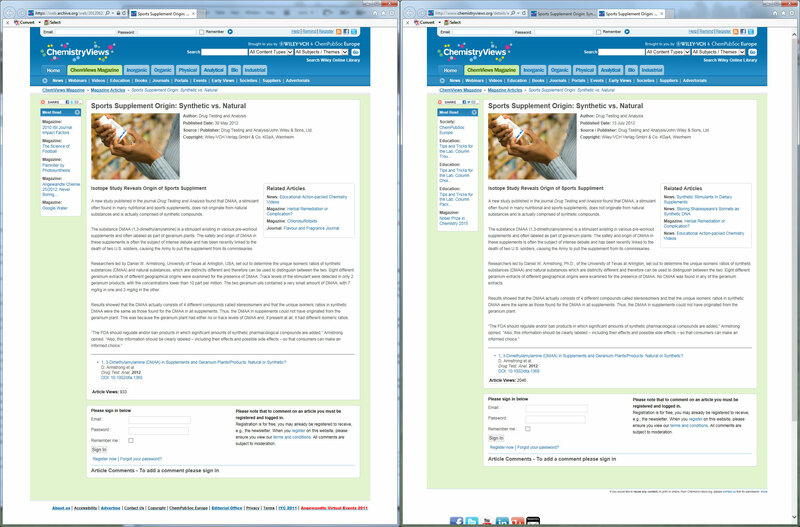 Why does Wiley’s website state “Revised: 6 April 2012” when there is strong evidence of further revisions between May 22 and July 12th of 2012? Shouldn’t the revision date be updated to reflect that? 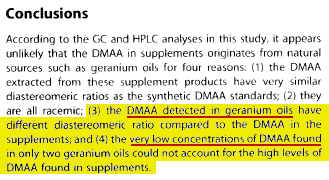 How would you even KNOW that “DMAA at, some trace levels in a geranium product would be chemically different to the DMAA used in supplements”?!?!?! ….Unless, perhaps, you’ve actually seen natural DMAA? Remember, a cornerstone of this case at the time was that USPLabs had originally labeled their Jack3d with “1,3 Dimethylamylamine (Geranium)”. Clearly, Jack3d’s DMAA wasn’t truly from Geraniums or Geranium Oil, so labeling it as such was indeed wrong. Does left- and right-handedness matter to the FDA? This may raise the regulatory question of whether a supplement ingredient of a certain molecular compound needs to have the exact same “diastereomeric ratio” as the one found in nature (ie the exact same amounts of “left-handed” and “right-handed” molecules). However, FDA employees have agreed that synthetically manufactured ingredients that are found in nature are legal per DSHEA. [26,10] Left- and right-handedness does not matter as far as DSHEA is concerned (otherwise every synthetic ingredient ever created, even vitamins, would come under fire. Either way, molecularly, DMAA is DMAA, and DMAA was found in this study and briefly published before it was altered. Only one of these papers can be true – which one is it? But Hi-Tech Pharma is not making that argument. They’re instead arguing that it’s found in nature and can be synthetically created. It’s completely valid to claim that you could never make enough DMAA from geraniums to manufacture all that Jack3d that was sold. But the current claim in question in 2016/2017 — that “DMAA is not a constituent of certain geraniums” — becomes far more questionable the deeper we dig. The data discovered in these court cases and alleged original supplementary data confirms the first claim, but definitely not the second. And it’s the second that Hi-Tech is arguing. The next part of this fiasco is where things get really nasty, at least if you ask Hi-Tech Pharmaceuticals and their legal team. Remember USADA and the previous study by Mahmoud ElSohly and Ikhlas Khan (which detected DMAA in geranium but conveniently placed the detection limits above them, amongst other things)? Well, they may be involved in this hatchet-job too. Interesting how this unpublished study fell into the hands of other researchers who were paid by the US Anti Doping Agency as well as the FDA and didn’t publish the entirety of their result set…..
We can’t completely ascertain the validity of Hi-Tech’s above statements, but we can tell you that the dates of the altered study and press release eerily align with the emails shown in Hi-Tech Pharma’s court documents above. With the added element of USADA employees forwarding the embargoed version of this study, things have admittedly gotten murky here. Thanks to Hi-Tech’s lawyers, we now know more than even USPLabs had previously known about this “study”, but nobody’s ever put it all together. Dr. Armstrong allegedly tells Elaine Watson at NutraIngredients-USA that the publication had closed, stating something along the lines of “I have just revised the press release for the journal. As soon as they are done proofing it, I assume they’ll get it on the web” (this quote was paraphrased from a phone call I had with Elaine Watson). Wiley-Blackwell began circulating an early press release of the study, titled “Stimulant Marketed as “Natural” in Sports Supplement Actually of Synthetic Origin”. The study was embargoed until May 30th (when it was set to publish), but it was available for access to Physical Science News researchers and reporters. Typically with embargoed papers, the work is done, but insiders can read it so that reporters have comments on it on the day of its release. This press has been verified through several sources, including a .doc file available here as well as the one we pulled off of ChemistryViews.com, archived here. The embargoed paper gets rapidly spread between news reporters, NSF employees, USADA, and even the Uniformed Services University of the Health Sciences, a health science university run by the U.S. federal government. Amy Eichner of USADA then forwards the email to the researchers at Ole Miss led by Ikhlas Kahn, who were in the process of conducting the other study discussed above (which also had some interesting activity). According to USPLabs, Wiley allegedly issued a press release that the Armstrong paper will be published on May 30th, 2012. IMPORTANT NOTICE: Please note that the authors have asked to postpone the publication of this paper following the discovery of a typographical error over the weekend, to allow them to investigate what, if any, effect this may have on the results. As such this paper will not be publishing on Wednesday and we would request that no stories are published on the results of this study until the paper is ready for publication. I just wanted to make sure you got this message and apologize for the delay. If you could send me a quick email just to let me know you’ve received this, that would be great. Thanks and again, I apologize for the delay. “Something” happens and the embargoed document is significantly changed, with a near-complete reversal of the conclusions. A public relations person for Wiley also allegedly indicates that the paper was not published due to a “typographical error” in the original, so the the paper’s publication would be delayed. Armstrong indicates that the paper was withdrawn and resubmitted because of a “typo” and a “misinterpretation” as well as his desire to add a conflict of interest statement. Wiley publishes the Armstrong paper in the Early View section of their Drug Analysis and Testing journal (ahead of print). In that full-text PDF, it’s stated that no DMAA was found. However, the key summary portion found on the page (typically written by the authors of a paper), states that DMAA was found in two samples and that they were of different stereoisomeric composition — ie. not synthetic. This key summary is still on Wiley’s website to this day, but we’ve of course archived it and archived our archive as well. Additionally, the supporting information section of the paper states that DMAA was found in geranium oil samples, comparing the chromatograms between the reference standard and the NOW Foods geranium oil where it was detected. This is presumably where the alleged but unconfirmed .doc file here came from. In response to USPLabs’ press release arguing the above points, Dr. Armstrong indicates that the original figures were actually in the 10s of parts per billion, not parts per million, and that when these samples were retested with a detection limit of 10 parts per billion, there were no detectable levels. He then indicates that the results were instead due to, “contamination” of his instrument by DMAA. …and wasn’t it supposed to be a “typographical error”??? Which one is it? USPLabs argues several of the above points in their second response letter to the FDA, at the time unaware of the alleged (per Hi-Tech) foreknowledge and collusion amongst funders and researchers of the three “negative” studies. The FDA dismisses USPLabs’ response letter, with the federal government using this preposterous piece of work (amongst others) as evidence. USPLabs finally throws in the towel, flushing $8MM of Jack3d and OxyELITE Pro down the drain. The FDA formally files their complaint for forfeiture against Hi-Tech Pharmaceuticals, officially establishing case number 1:13-cv-03675-WBH. Hi-Tech Pharmaceuticals files their answer to the aforementioned complaint, demanding a jury trial. This begins the case continues through the appellate courts nearly four years later, collecting much of the evidence used in this article along the way. Is this NutraIngredients-USA article hinting at foul play? Even others covering this study may have smelled something fishy at the time. A NutraIngredients-USA article covering an interview about this situation states that “[the study’s publication was delayed owing to what the publisher Wiley described as a ‘typo’ last month]”. We now know that the University of Texas Arlington press department, by way of the researchers, told NutraIngredients-USA it was a ‘typo’. But we find it interesting to note that NutraIngredients-USA put the word ‘typo’ in single-quotes, as if calling attention to it. So which one was it? Was it a ‘typo’? Was it really “contamination of instruments”? Or was the HPLC-Fluorescence data simply discarded and changed (along with ~2000 words)? We are still yet to understand how they define ‘contamination’, especially when the “contaminated” DMAA measured was different from the DMAA accused of contamination. What is the process to address such “contamination”, and shouldn’t that have been disclosed in the final paper or the supplementary data? It seems that even the journalists covering this article at the time knew that this ~2000 word change was no ‘typo’. Sadly, USPLabs had known this all along, but the hatchet had already been swung, and nobody would listen. No Comments | Posted in Supplement Ingredients, Supplement News | Tagged 1-3 Dimethylamylamine, Amy Eichner, Daniel Armstrong, DMAA, Elaine Watson, FDA, Geranium, Hi-Tech Pharmaceuticals, HPLC, Ikhlas Khan, Jared Wheat, Lawsuit, Mahmoud ElSohly, Methylhexanamine, NutraIngredients-USA, Paul Simone, Ross M. Woods, University of Texas Arlington, USPLabs, Ying Zhang, Zachary Breitbach.